Kathryn Sofich joined our all-volunteer board in 2010. Before that, she was introduced to our work through the magic of the Holiday Bike Drive. 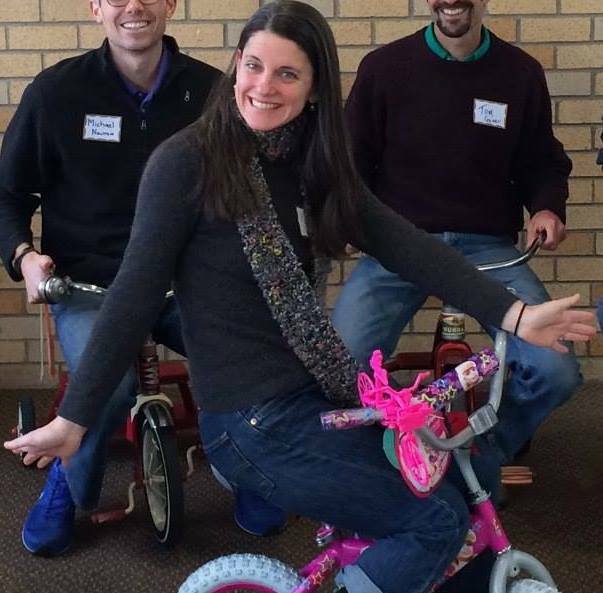 Her tireless commitment to the mission of the Community Cycling Center is evident in her leadership of our board, support of our staff, and engagement as a volunteer. Today we want to honor Kathryn’s many years of service and dedication to our organization in this volunteer spotlight! How did you first hear about the Community Cycling Center? When I moved to Portland over 15 years ago, I quickly began getting curious about biking. Wanting to know enough to take care of basic maintenance needs, I volunteered a few times to clean bikes up for the Holiday Bike Drive, which led to volunteering several times at the Holiday Bike Drive – I was hooked at that point. I was honored when asked to be on the board to support the organization at a different level. Why did you decide to join our board? Since the minute I settled in Portland I was impressed with the bike infrastructure and programming. However, I was always searching for a social equity connection and that is a gap that Community Cycling Center has helped to fill. I got tired of seeing the same sort of faces around the table talking about bike issues and learned about the Barriers to Bicycling work that the Community Cycling Center did and wanted to help keep that work moving forward. It’s incredibly important to diversify the voices around these tables to hear from a range of experiences. Which priorities are the Board of Directors focused on currently? Supporting staff and the providing direction on the priorities of the organization, updating the strategic priorities, and continuing to seek reliable and diverse funding sources. Also, the board has doubled in size, which has been amazing as we have some incredible new board members. Over this last year we have been figuring out how we want to operate and function now that we have doubled in size. 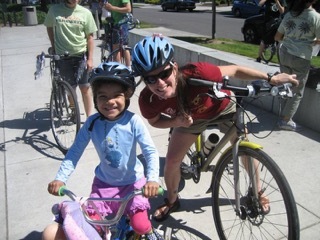 I went on a Sunday Parkways ride with New Columbia residents and met a young girl with the same helmet. She was so excited that we had the same helmet (with flowers on it) and she insisted we ride together. Then over a year later I saw her at the Village Market with her grandma. We recognized each other and caught up. Do you have a favorite Community Cycling Center program? The work at New Columbia and Hacienda to grow leaders in those communities to find ways for their communities to interface with the bike. What does “community” mean to you? Being in a place where you can learn from each other, listening to each other experiences, and find those things you can relate to that can be the basis for a relationship. Community also means smiling and saying hi because you recognize people. I like all kinds of riding so my dream bike would be a bike that I could push a button and it could go from a road bike to a mountain bike to a commuter bike. And then a special button would be reserved to push for an electric assist component that I could use to get home after all the night meetings I go to!